Soooo cheesecakes aren't that hard to make. Don't take a lot of time, aren't real complicated and are perfect thing to bake when wanting to put to use the nifty springform pan with the carrying case that you got for a wedding gift. Why? One (I) shouldn't be able to simply say "Geeze! It's a beautiful day! Let's go buy massive amounts of cream cheese and whip up a cheesecake!" 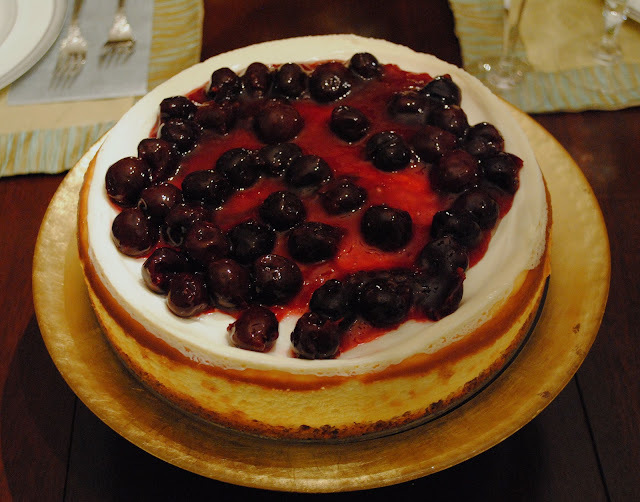 I made this here cheese cake for Christmas Eve dinner last year (HA! Just a week ago, silly) and it was quite the hit. Also got a chance to use my pretty gold cake plate which is always a plus. Not everyone was fired up about this cheesecake. Baby Girl A loudly proclaimed "I don't want any" but then, oh then, we caught her getting a closer look after dragging a chair up to the buffet. 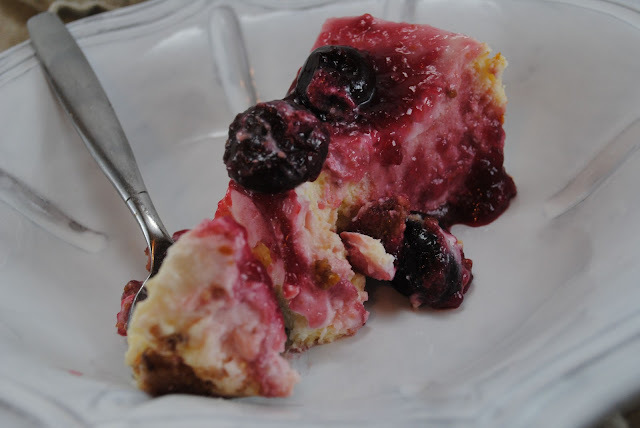 Have fun with this cheesecake! And with this Wednesday! To make the crust, combine ingredients well and press into a spring form pan. For filling, beat the cream cheese until smooth. Add in the sugar, lemon juice, vanilla and eggs. Pour on top of crust. Bake 40 - 45 minutes. Remove from the oven and allow to cool for 10 minutes. While it's cooling mix together the sour cream, sugar and 1 tsp vanilla. Spread on top of the cheesecake and bake for 10 more minutes. Top with topping of your choice! Place all ingredients together in a medium saucepan. Bring to a boil. Once it's boiling, cook for an additional one or two minutes. 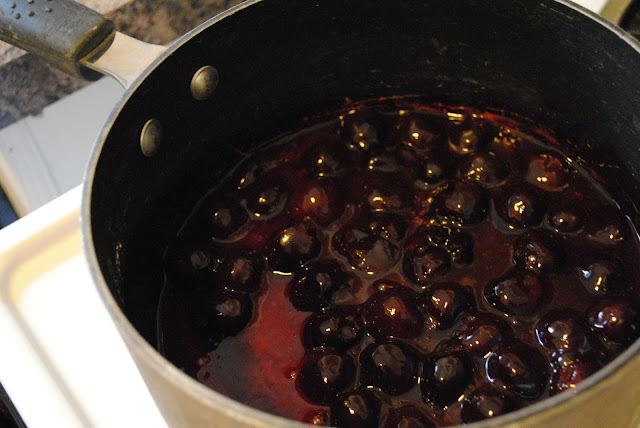 Remove from heat and allow to cool completely.